The beginning: it is 1773. Kitt, a brother who seeks his disappeared sister, arrives at an Italian villa to find it abandoned, the dinner table laid with forgotten cakes and sweetmeats. 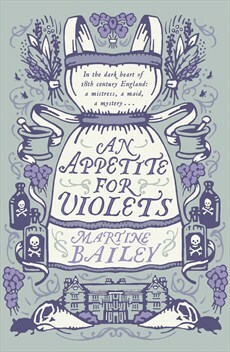 You think the story of An Appetite for Violets by Martine Bailey will be about Kitt’s sister Lady Carinna but she is a bit-player. The real story belongs to her under-cook Obedience, Biddy, Leigh, forced to accompany her mistress on a Grand Tour to the Continent. After this first short section at the Villa Ombrosa, the story starts at Mawton Hall in 1772 where the servants are surprised by the arrival of their new mistress, without her elderly husband. Lady Carinna asks Biddy to copy her favourite violet sweets bought from an expensive London store. Although Biddy is an honest cook she is not a craftswoman, and her attempt produces “shocking poor copies of the originals.” She is rescued by the Indonesian footman Mr Loveday who provides a box of original sweets to substitute for Biddy’s home-made variety. Pleased with the sweets Lady Carinna gives Biddy a rose silk gown. Trying on the dress, Biddy gets a glimpse of a life so different from her own. This experience bonds the two servants, a bond which lasts throughout their journey to Italy. Biddy and Loveday each have their own way of escaping the demands of their mistress, and they vow to support each other no matter what happens. But then they start overhearing secrets, Loveday reads the letters he is bidden to deliver, and Biddy becomes entwined in Carinna’s plan of deception. 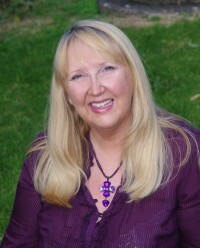 To visit Martine Bailey’s website, click here. Sounds like quite a novel! I always enjoy reading your reviews, Sandra. Great review, Sandra. Intriguing story.